Acupuncturists and herbalists will have to comply with tough new rules if they want to continue to treat patients, under government proposals. 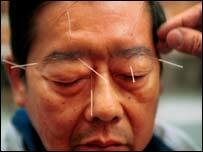 Ministers have outlined plans to tighten up the law on who can practise acupuncture and herbal medicine. Under the proposals, practitioners would have to register with a new regulatory body before they could work. Ministers say the measures, which are out for consultation, will help to protect patients. An estimated one in five Britons regularly go to acupuncturists or herbal practitioners. However, at the moment there are no rules on who can and who cannot call themselves an acupuncturist or herbal medicine practitioner. Around 4,000 practitioners are registered with a number of voluntary organisations. However, many others are not. Under the plans, a new Complementary and Alternative Medicine Council (CAM) will set out the minimum training requirements for acupuncturists and herbal practitioners. Only people who meet these requirements would be allowed to register with the council and call themselves an acupuncturist or herbal practitioner. Those who call themselves an acupuncturist or herbal practitioner without registering could be fined. The CAM would operate in a similar way to the General Medical Council, which regulates doctors. It would be able to ban rogue practitioners from practising. The House of Lords science and technology committee recommended these changes back in November 2000. "People are increasingly turning to complementary medicine," said Health Minister John Hutton. "We estimate that there are over 4,000 practising acupuncturists and herbalists in the UK, none of whom currently have to adhere to professional standards of training. "These proposals to regulate the industry will reassure patients and the public that herbal medicine and acupuncture practitioners are not only suitably qualified, but also competent and up-to-date with developments in practice." Mike O' Farrell, chief executive of the British Acupuncture Council, said the organisation had been pressing for statutory regulation. "Today's launch is a starting point for further debate that we hope will achieve the most practical and effective solution for regulation," he said. Simon Mills, chairman of the British Herbal Medicine Association, said: "We strongly approve of these developments." Mr Hutton also unveiled proposals to regulate health support workers, like hospital scientists and therapy assistants. "Professional staff who are currently unregulated are increasingly working as part of a wider healthcare team to provide efficient and high quality care. "Proper arrangements therefore need to be put in place to regulate the practice of all staff who provide direct care to patients," he said. Karen Jennings, head of health at UNISON, welcomed the move. "UNISON has nearly 100,000 Health Care assistants and we have long called for proper regulation to establish minimum standards of skills and expertise before they are able to lay a hand on a patient." The British Medical Association welcomed the move. "We first called for this type of regulation in 1999," said a spokeswoman. "We believe it is important that patients are protected against unskilled or unscrupulous practitioners of health care." The consultation process on the proposed changes will run for three months. Ministers hope to introduce new laws late next year. "At the moment, anyone can offer complementary therapies"